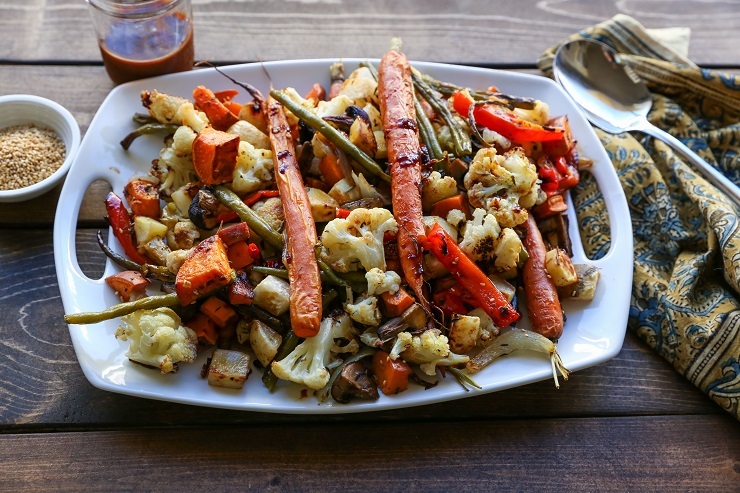 Seasonal roasted vegetables with an Asian-style honey ginger garlic glaze – a great side dish for any time of year, and perfect for sharing with family during holiday gatherings. This post is sponsored by San-J. 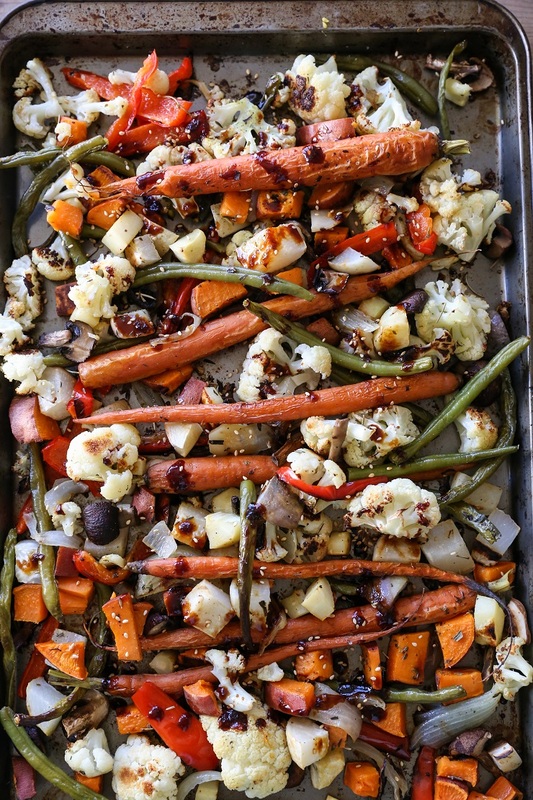 If you were privy to yesterday’s discussion on the life lessons I need to learn over and over again versus the lessons that really hit home on the first go, here is a perfect example of the former: not over-eating roasted vegetables. I literally remind myself of this weekly. While my vegetable over-consumption habit bodes better with my mind, body, and soul than my periodical ice cream binge upon a full sinful pint, the behavior is still what I would label “problematic,” but in a hurts-so-good kind of way…still, in a cognitive behavioral therapy-necessary sort of way, but also in a lesser of two evils, #firstworldproblems sort of way. 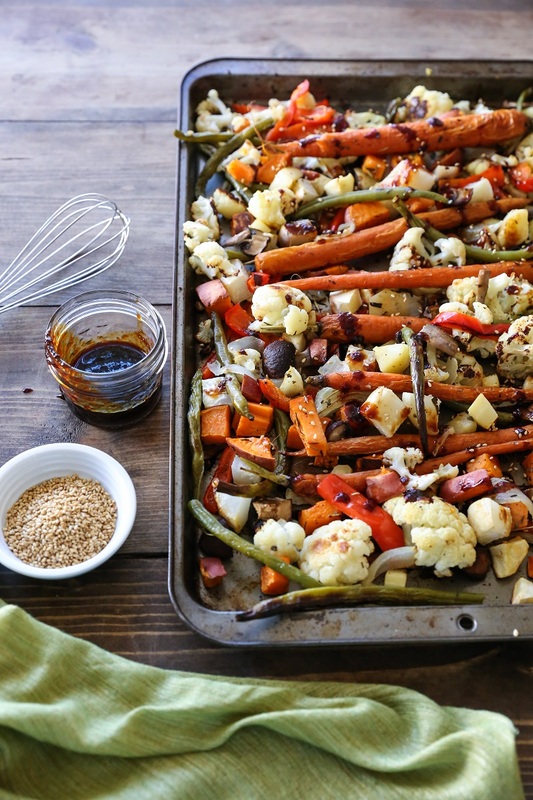 The Asian-inspired gingery garlicky honey soy glaze for these veggies: game.change.er. Big in flavor, quick and easy to prepare, the sauce bumps up your vegetable consumption experience with hardly any effort. I used San-J Gluten-Free Organic Tamari Soy Sauce (the reduced sodium is usually my preference) to prepare the Asian-inspired sauce for this recipe. 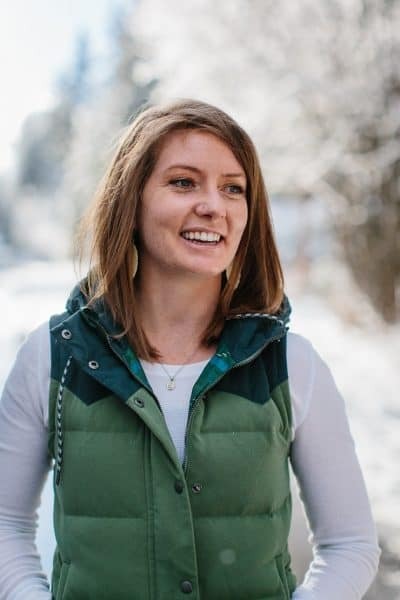 For those of you who aren’t familiar with the difference between regular soy sauce and tamari soy sauce, it’s simple: regular soy sauce is typically made using equal parts soy beans and wheat, whereas tamari soy sauce is made of entirely of soy beans (or sometimes predominantly soy beans and a small amount of wheat). San-J’s approach to tamari is with 100% soy beans, making it naturally gluten-free. I’ve been using San-J’s Tamari ever since I stopped consuming gluten five years ago. Its quality and flavor is consistent and rich – perfect for adding to any of your stir fry recipes, including in sauces, spreads, and even adding to Asian-inspired soup. Taking the same approach as reducing balsamic vinegar, I reduced the Tamari along with honey, fresh ginger, and garlic, to create a flavor-infused glaze/sauce to spruce up the veggies. The way I see it, this would make a marvelous side dish for your Christmas feast and is a nice change-up from a traditional roasted veggie dish. The order of operations for this recipe is simple, although it does require some time. We first chop up all the vegetables (I like leaving the carrots whole just for funsies), coat them with olive oil and a sprinkling of spices, then roast them in the oven until all golden-brown and delicious. While the vegetables are roasting, we prepare the Asian-style honey ginger glaze, which only takes about 5 minutes. 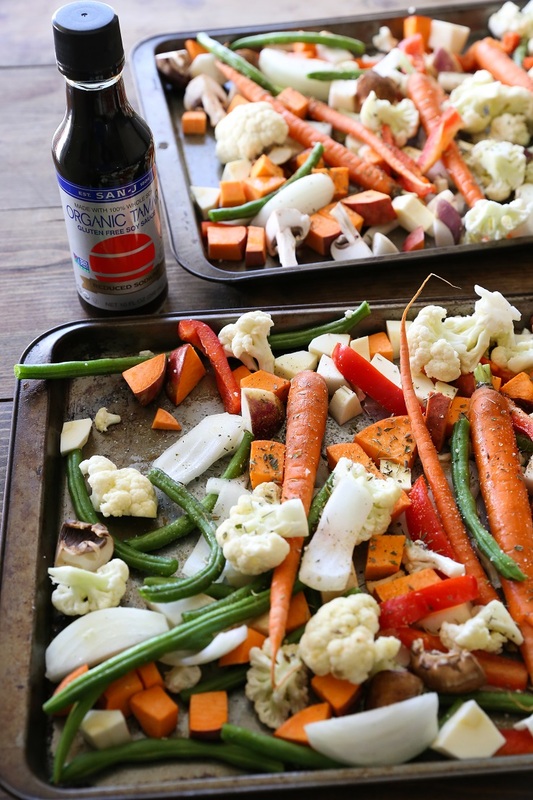 Once the veggies are out of the oven, we drizzle the glaze over the veggies and serve it up! Use any hearty seasonal vegetables of your choosing. For instance, any bell pepper, pasilla or poblano peppers, bok choy, fennel, beets, butternut squash, acorn squash, zucchini, etc. Bump up the heat level of the dish by sprinkling the veggies with a small amount of chipotle powder, cayenne, or red pepper flakes. You can also add more red chili sauce (sriracha) to the glaze recipe for added heat. Scale down the amount of vegetables in this recipe if you’re serving 2 or 3. Place this bad boy on your Christmas menu…your entertaining menu…your life menu. Possibly addiction fairly warned. Spread the chopped vegetables over two large baking sheets (or use one large casserole dish if you don't have two baking sheets). Note: you can leave the carrots whole, or chop them. Drizzle vegetables with olive oil and sprinkle with Herbs de Provence (or Italian seasoning), chili powder, garlic powder, and sea salt. Use your hands to toss the vegetables until everything is well-coated. Roast the vegetables in the preheated oven for 40 minutes, turning once, or until they are cooked through and golden-brown. While the vegetables are roasting, prepare the Asian Garlic-Ginger Glaze. Simply add all of the ingredients to a small skillet and bring to a full (but controlled) boil. Reduce the heat to a gentle boil and cook until reduced by half, whisking frequently, about 4 to 6 minutes. Remove the glaze from the heat and set aside until ready to use (Note: as the glaze sits, it will continue to thicken). Once vegetables have finished roasting, drizzle or toss them with the garlic-ginger glaze, and serve alongside your main course. I’m obsessed with San-J’s Tamari and use it all of the time. 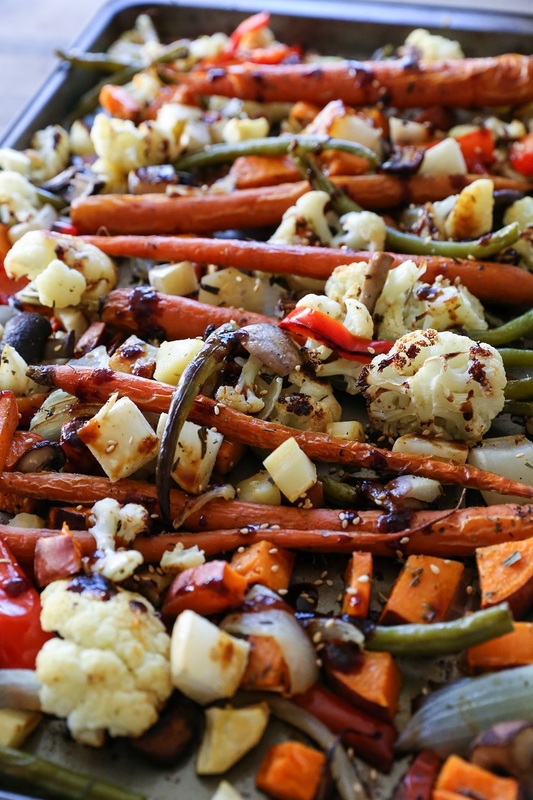 I can imagine how good it tastes with the garlic and ginger on these roasted veggies. Pure winter veggie perfection, m’dear! If everyone binged on roasted vegetables, cancer would be cured, intelligence would increase, and we would have world peace! This glaze sounds amazing, and I have all the ingredients already–fellow tamari fan over here!! Can’t wait to try this. 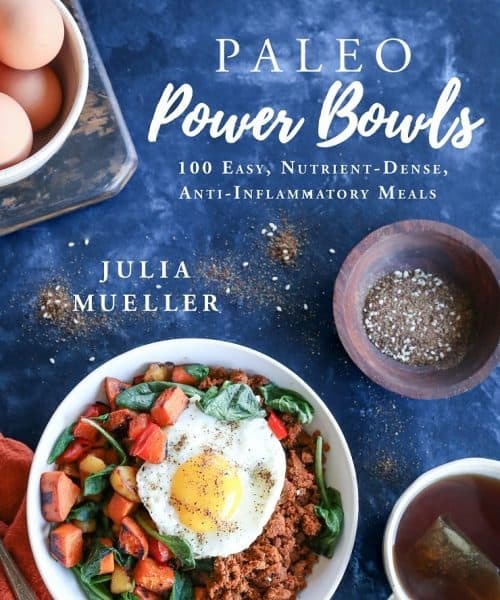 haha yeahhhh I could easily eat an entire pan of roasted veggies if I let myself!! These sound SOOO good!! 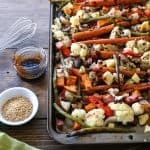 I’m completely addicted to roasted veggies too, and I pretty much always make them plain, but that’s about to change with this sassy asian glaze!